Games that feature the Simultaneous Action Mechanic allow all players to act at the same time, changing the nature of turn taking and making the process of playing the game, sometimes, that much quicker. In these games, each player decides what they want to do at the same time. Actions are revealed and executed according to the game’s parameters. The best part of these kind of games from the perspective of gamified learning is that in a larger classroom where you still want to create a gamified experience, it can be a big help to have all of the students decide how they want to act as one “turn” and then move on to resolving those actions. In this regard, the mechanic functions in the gamified classroom more as a game management tool than anything else. In the games listed below, however, they all function to accentuate the actual play experience. 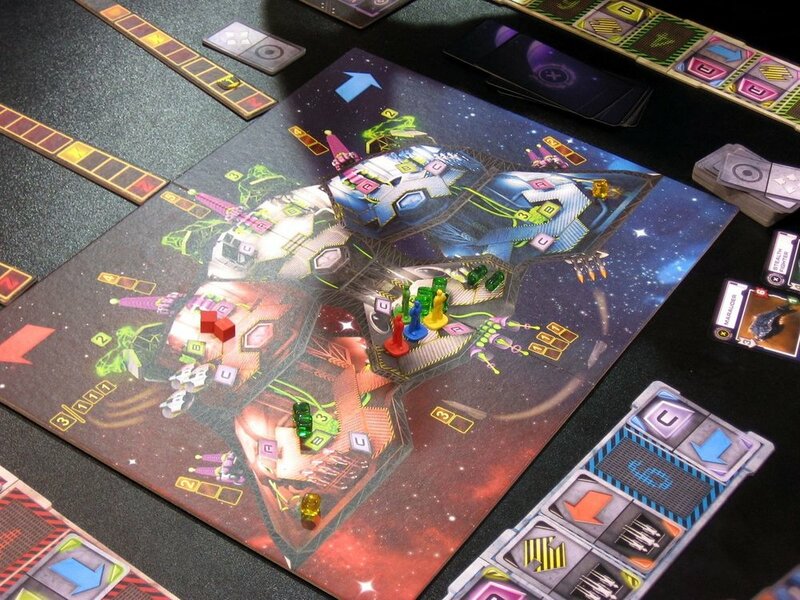 In Among The Stars, players are assembling their own space station and trying to maximize the value of that station through the strategic drafting of cards from an ever shrinking available deck. In this regard, the game is a bit like 7 Wonders, but I think in many respects the game is more fun. Each thing you build into your station you have to pay for and the cards all have interesting mechanics that relate to or trigger from other cards or other mechanics. A real delight of a game, short, and potentially useful in helping a student understand economic relationships. Dixit is one of the greatest family games of the last ten years or so. Players each have a set of cards featuring abstract art and on their turn, the active player chooses one of her cards and gives it a short description. Each of the other players then try to match that description with a card in their own hand. Once all the cards are displayed, the other players try to decide which card was the card selected by the active player. Learnable by anyone and wickedly replayable, Dixit should be in nearly every classroom. An old classic recently reprinted, players in Junta take on the roles of different members of the cabinet in a “banana republic.” The goal is to siphon funds from the national treasury into your Swiss bank account without being assassinated or in some other way meeting with a terrible end. The president of the republic doles out funds from a variable pool of money at the start of each turn. Satirical, funny and at times infuriating, the game is a must play, particularly if you are interested in unconventional takes on politics. Designed by my friend François Rouzé, Room 25 is a collaborative game in which the players are prisoners trapped in a structure that appears to have no exit. It’s a tricky game, made more so by the fact that one player just might be a traitor in your midst. An exciting and challenging game that would be excellent for developing critical thinking and collaboration skills right out of the box. Space Alert is a mad race against time for the players, all of whom are officers on a starship that is having the worst 10 minutes of its existence. The players are the crew of the doomed ship and as a literal clock ticks away the threats that the ship has to overcome, players are scrambling about the ship trying to ensure that their actions are sufficient to save the vessel. Heck, it only takes 10 minutes to play. Give it a shot!